At Cook Orthodontics, we make smiling easy! Tranquil, relaxing, and calming - our practice offers a peaceful atmosphere where you and your family will feel comfortable whether you are receiving treatment or waiting for someone who is. As a father and family man himself, Dr. Cook understands the needs of his young patients and their families, and treats every person who comes to our practice with the respect, sensitivity, and attention they deserve. Our practice focuses on the Louisiana family! We offer convenient office hours, financial plans, and customized treatment options designed just for your smile. 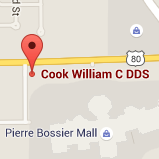 Please contact Cook Orthodontics at (318) 869-1672 for a free orthodontic exam and consultation. Cook Orthodontics provides quality orthodontics for children, teens, and adults in Shreveport and Bossier City, LA (Louisiana). 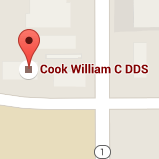 Dr. William Cook specializes in orthodontics, offering orthodontics and braces for children, teens, and adults. Contact Cook Orthodontics to schedule your orthodontic consultation.